Pictured above: August Dancy, Charles Youngblood, Raymond Nichols, Raymond Henson, George Mc Cain, Earl Eller. This Seagrave 750 GPM Pumper arrived in December, 1925. 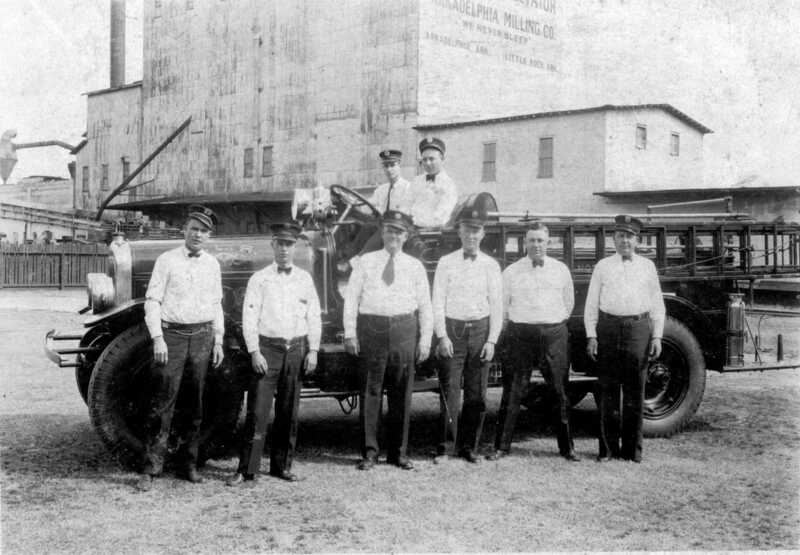 It was stationed at Central Station, and was the biggest and most powerful fire apparatus North Little Rock had owned by far, until 1925. The Seagrave had no booster tank, nor did it have a chemical tank. It served at Central Station until 1939, when a new Seagrave closed cab pumper arrived. The engine pictured above still carried the Company designation "1" and the '39 became "Company 4." As a small kid, I remember my parents taking me to Burns Park. There I got to play on an old fire engine. I now realize that it was the engine pictured above. Somehow, the grand lady deserved a better fate than being torn apart by kids and rotting in the weather. There are still stories told by retired NLR Fire Fighters concerning this pumper and the flood of 1957. It pumped non-stop near Crockett Street for many, many hours. Thanks to Captain James Dancy (retired) of the NLRFD for the above photo. This apparatus is the 1925 Seagrave 750 GPM Pumper. The Fire Fighters are identified as: (L to R) J.P. Caldwell, Tom Welch, A.H. "Red" Dancy, and Raymond Nichols. J.P. "Pete" Caldwell and Tom Welch were both later to become Chief of the NLRFD.